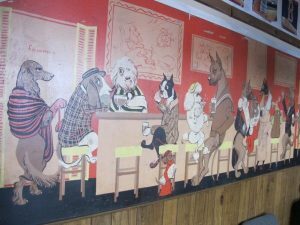 “Bar Hounds,” a mural by Constance Depler Coleman, at the New Waverly, a Bangor bar. If you’ve been in the New Waverly, the Broad Street bar that’s existed in Bangor in one location or another for nearly 100 years, you’ve seen the dogs. Not owner Jimmy Puiia’s constant companion, chocolate lab Buddy. No, these are the dogs on the wall, as depicted in the 10-foot mural in the games room at the Wave. The print shows 12 dogs of varying sizes and breeds, all with a humanoid shape and dress, all sitting at a bar. There’s the hoity-toity cocker spaniel and boxer, dressed to the nines for a night on the town. There’s the rumpled-looking basset hound, drowning his sorrows. There’s the eager little dachshund, wagging his tail for attention. Until recently, Puiia and his son, Anthony, knew very little about the origin of that mural, other than the fact that Puiia bought it at the old Sherwin Williams on Central Street back in 1975, as a heavy piece of custom wallpaper to be installed on the wall. There the image has been for 42 years, with Waverly patrons imagining what dog represents whom. But three years ago, regular Waverly-goers, the Sohns family — siblings Tony, Annette and Amanda, and their parents, Jim and Arlene, Bucksport natives that own The Rock & Art Shops in Bangor, Bar Harbor and Ellsworth — stumbled across the mural’s origin story. The family was in New York City in the summer of 2014, at the NY Now Gift Fair, to buy new products for their shops. Making their way through the thousands of vendors set up at the Javits Center, the siblings stopped dead in their tracks. There, in front of them, were the Waverly dogs. “There was this giant cut out of the great dane from [the mural] right in the middle of the booth, and we all just kind of went ‘Holy crap! It’s the Wave dogs!’” Amanda Sohns said. The booth was run by Amanda Coleman Voss, daughter to original artist Constance Depler Coleman, now 91 years old. Depler Coleman is a pet portrait artist, who in the 1950s and 1960s created a series of images of dogs in various social scenes; mostly dogs in bars, but also in nightclubs and in sports scenes. Several of her larger paintings — including “Bar Hounds,” the name of the one at the Waverly — were licensed to distributors, that printed them on barware and reproduced them as wall art and other decor aimed specifically at bar owners looking to decorate their establishments. In the 1970s, countless bars across the country had “Bar Hounds,” “Hep Hounds,” “Western Hounds” and other images on their walls. By the 2000s, however, most of those bar decorations were gone, and her images were no longer being mass produced. Depler Coleman went on to a successful career beyond the “bar dogs,” painting pet portraits for the rich and famous, including former President George W. Bush and Oprah Winfrey. Her daughter, Amanda Coleman Voss, in 2012 started an Ohio-based business printing her mother’s now retro-chic art on items including glassware, posters, tote bags, coasters and more — the same one the Sohns family encountered in New York. The Puiia family was so tickled with the new information about their mural that they went online and bought some coasters themselves.